VPS9 Review 2019: Is VPS9 a Good Hosting? VPS9 is a hosting company that offers managed, self-managed, and cloud VPS plans plus bare metal servers and streaming servers. You won’t find standard shared hosting here. Founded in 2010, VPS9 is a privately-held VPS hosting provider that operates as a brand of Apeiron Global Pvt. Ltd. It offers an impressive uptime guarantee, provides comprehensive customer support, and has data centers in the U.S.A., Germany, Netherlands, Russia, and Singapore. VPS9’s website is in English. SSL certificates (to give your customers confidence and improve your search engine ranking) and the Softaculous one-click installer (to install additional applications) are offered separately. This company’s servers are built on super-fast SSD storage to maximize performance. Looking for shared web hosting? Then you’ll be astonished at VPS9’s high priced plans, especially when you consider that SSL certificates (from Symantec, GeoTrust and RapidSSL) and the Softaculous one-click installer are optional paid extras. But these are not shared hosting services, and the VPS prices for a worldwide presence may well be worth the cost. You can rent a VPS from VPS9 on one-, three-, six-, or twelve-month billing cycles. You can get a discount if you commit to more than a month at a time, and you can feel reasonably comfortable about doing this thanks to the 30-day money back guarantee (although this may be at odds with a 15-day money back guarantee mentioned elsewhere in the FAQs). Payments can be made through PayPal, WebMoney, bank transfers, iDeal, Alipay, Yandex, Qiwi, Dotpay, UnionPay, TrustPay, and Giropay. One thing I really like about VPS9 is the dedicated 24/7 support. Customer complaints, queries, and concerns are handled through multichannel support systems including phone, live chat, email, fax, or ticket. You can even write to the company! There is a well-populated knowledge base that should help a lot with self-support; and an FAQ section. onClick="trackClickout('event', 'clickout', 'Vendor Page - Visit User Reviews', 'VPS9', this, true);"
They will always be publishing cool stuffs. I am their follower in Facebook but never bought any service. Now its been 2 months I have hosted my site and its working great for me. 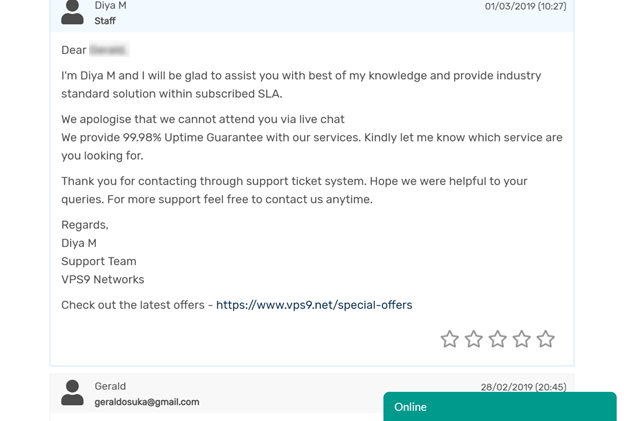 Thanks to VPS9 for their amazing service and I will always recommend VPS9. I researched on VPS9 before taking the services. I found that everywhere they are known for their customer support and their services. Today after experiencing 7 months of their services, I am able to say that they are just the best. I just like them a lot. Till date recommended VPS9 to all my colleagues and friends. Really amazed by their services. I would expect the same services for a longer time. I hope they will be able to give awesome services to me for more than 20yrs. If this is the case then I'll be their permanent customer. My hosting provider was Hostgator. I have been their customer since 2011 but then once I faced the issue and they did not provide proper support so I switched to vps9. Now I'm using VPS9 from 3 years and never faced the issue. They are known for their customer support. VPS9 operates fully redundant infrastructure at state-of-the-art data centers, backed by a 30-day money-back guarantee, a 99.98% uptime guarantee, and 24/7 support from industry experts. For managed, self-managed, and cloud VPS plans, visit VPS9. Wondering how VPS9 stacks up against other Web Hosting companies? Enter any other Web Hosting company and we will give you a side-by-side comparison.